Cindy is back with us for a visit. Previously she has shared how she customized the 2+2 Blouse and how she made a spaghetti straps top out of the Class Picnic Blouse. Also, last year her family hosted Flat S (and taught her how to surf!). Now she is stopping by to tell us about her favorite pattern. Thanks so much for being here Cindy! Hi, I’m Cindy from Siestas & Sewing and I’m a long time Oliver + S fan. It’s hard to pick a favorite pattern as all of them are pretty terrific. 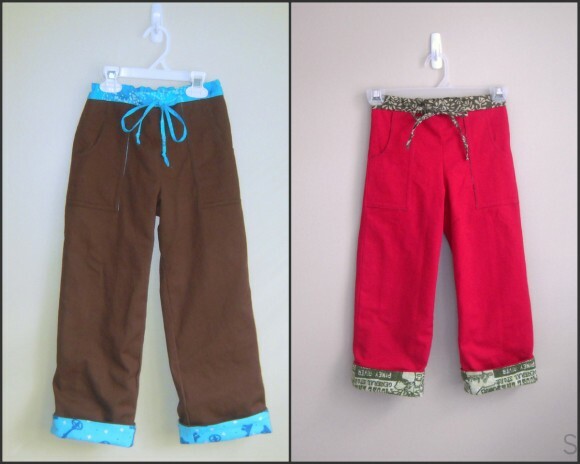 But if I had to choose one, I’d say it’s the Sandbox Pants. 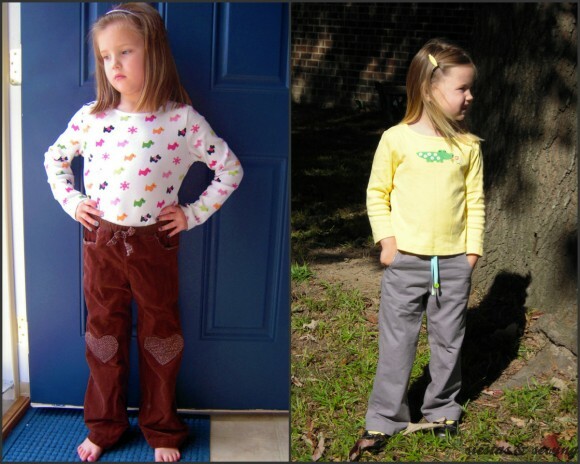 The Sandbox Pants are a great basic pull on pants pattern. The fit is perfect, neither too slim nor too relaxed and has a nifty elastic/drawstring combo waistband. I’ve sewn it at least 10 times over the years for both my son and my two younger daughters. A little scary, huh? One thing is for sure, my son has grown a lot in the past five years and my photography skills have improved! 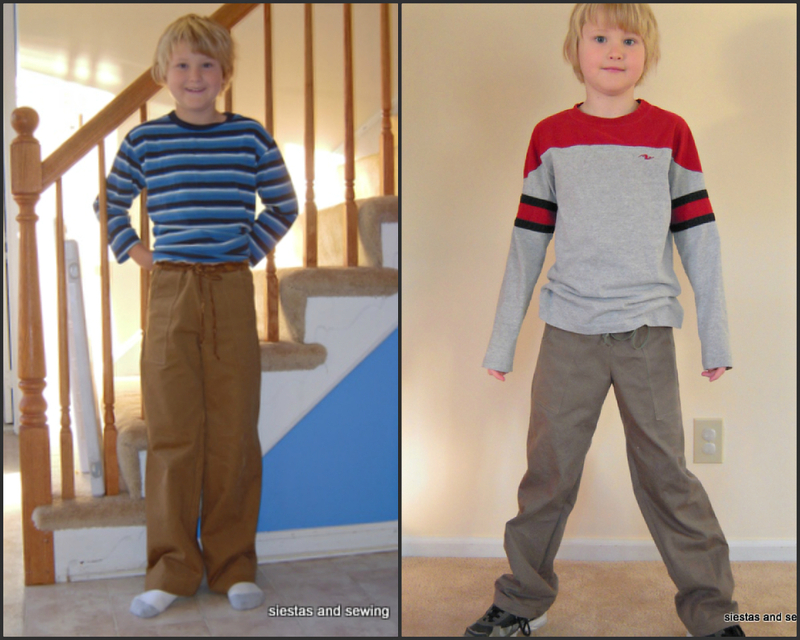 Before Patrick outgrew the pattern, the Sandbox was my go-to pattern for boy pants. They are an easy sew, fit well, and most of all (to him!) they are comfortable to wear. I’ve played around with the pattern over the years, changing out pockets and adding knee patches. I’ve also lined the pants to make cozy winter pants for my nephews. And used the starfish stencil to make appliqués. 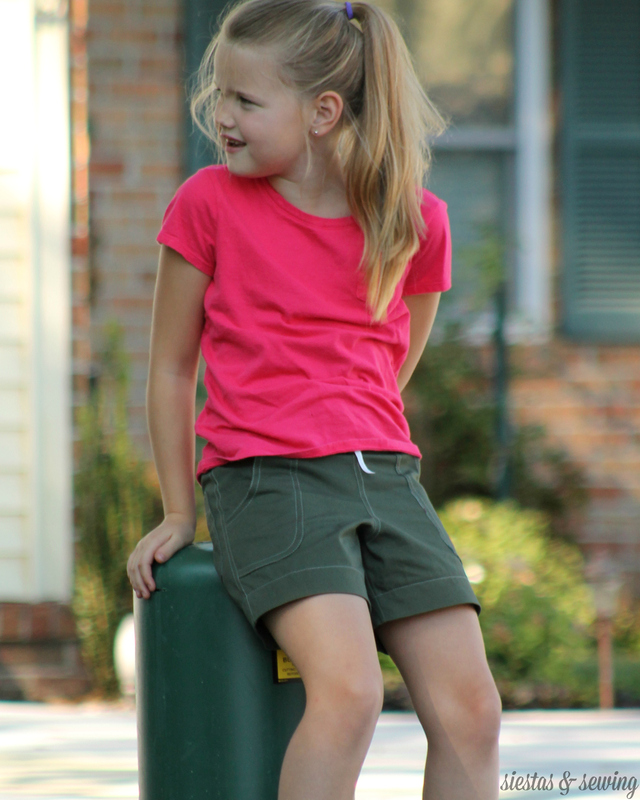 The Sandbox pants make great shorts too! 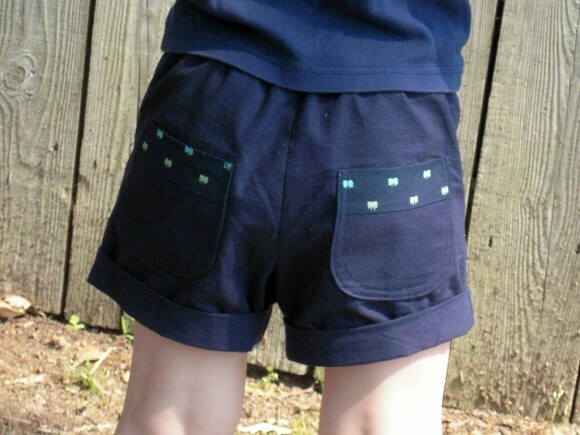 My little girls wore this pair for three summers before they finally outgrew them. So, when Brenna Kate needed some new shorts to wear to school, I pulled out my trusty Sandbox pattern and went to work. I used a rib knit fabric for the waistband, rounded the front patch pockets, and went to town with the topstitching. BK likes them or at least I assume she does as she wore them for 24 hours straight before I finally convinced her to change so I could wash them! I couldn’t agree more with Cindy! Great post Cindy. I totally agree, they’re an excellent fit and so versatile for both boys and girls. Think I need to go and make a pair right now. You are the shorts queen Cindy. Thank you featuring my version. I delayed buying this pattern for so long, thinking it was a “bit basic” compared to other Oliver + S patterns. I was so wrong and now I love them too. 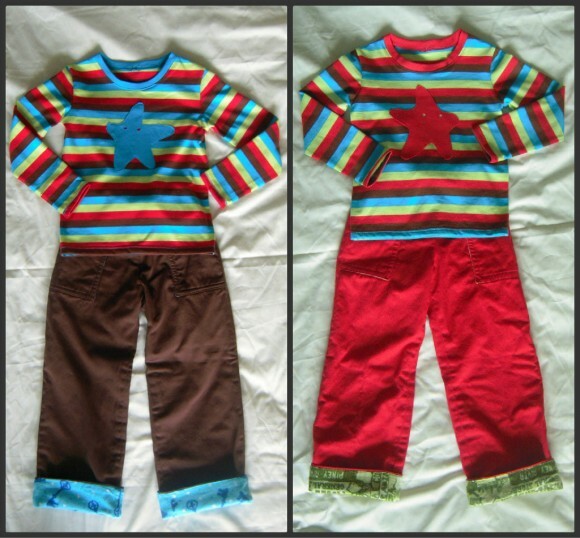 Great post Cindy, and your latest topstitched ones are awesome! Great post Cindy. This pattern has been a good investment to use for all your children. Those heart knee patches are the greatest! This is a pattern we haven’t purchased yet…but now want to, given your write-up! Thanks for showing us the possibilities for a girl…. 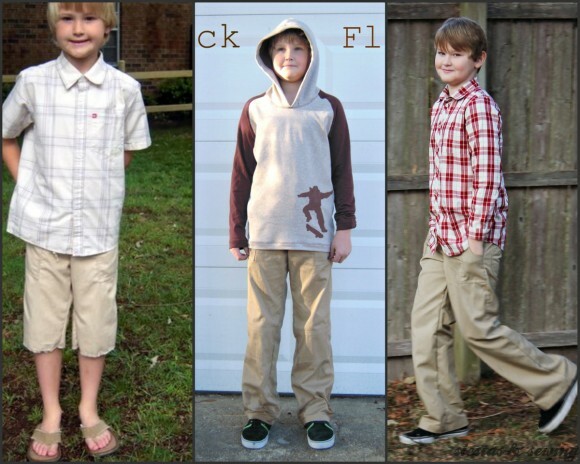 What a great resource for seeing the many looks of the Sandbox Shorts! !